Calan MacLeod is a woman who has overcome every challenge she has faced. Now comes the hardest test of all, healing the wounds of her past. Can young Angela help her or is she going to be a further complication? When a famous plastic surgeon’s decomposed body surfaces in Tampa Bay with a bullet in its head, Federal Judge Willa Carson’s little sister is caught in a high-stakes game of greedy lawyers, blackmail and deceit. Carly Austin knew the victim too well. Does she know too much about the killer, too? Can Willa save Carly from herself and the murderous conspiracy? Or have they killed Carly, too? 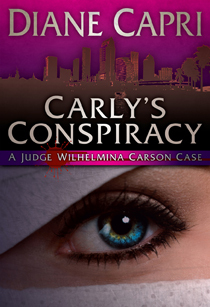 Judge Willa debuts in this fast-paced mystery filled with great characters, humor and suspense. Diane Capri is a recovering lawyer. She’s a snowbird who divides her time between Florida and Michigan. An active member of Mystery Writers of America, Author’s Guild, International Thriller Writers, and Sisters in Crime, she loves to hear from readers and is hard at work on her next novel. This entry was posted in Novels, Reading and tagged Calan, Carly's Conspiracy, Diane Capri, mystery, Prudence MacLeod, series, SJ Driscoll on November 9, 2011 by sallyjanedriscoll. I’m finding so many interesting writers through WANA…I need more days in the week to read all these great books! Good luck with sales, Prudence and Diane!!!!! Great to see books from our WANA peeps featured so we can check them out! Hi Sally, thanks so much for featuring Calan, she is one of my favorite characters.